Can-A-Wipes are the best friend of anyone with a dirty job. Whether you’re trimming, painting, fishing, farming, plumbing, or working on cars, Can-A-Wipes get you out of any sticky situation. 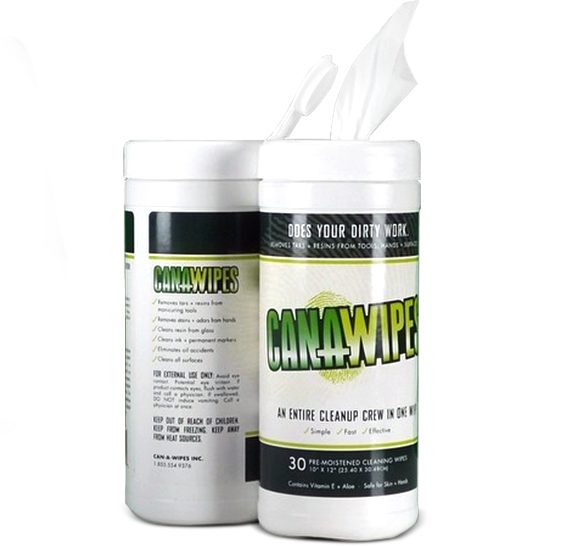 Can-A-Wipes are specifically designed to remove the smell of cannabis and tobacco. Use Can-A-Wipes to remove resin and other sticky residue from your fingers, hands, tools, clothes pipes and other surfaces. If you have problems with the smell of tobacco or cannabis in your grow room, car or home use Can-A-Wipes to wipe any surface that has come in contact with the smell. Leaving the golf course with black and sticky hands? Don’t fret, Can-A-Wipes has you covered! The 30 sheet can fits nicely into your gold bag (or even cup holder) and offers you the chance quickly and easily wipe off your hands, clubs and balls between holes. Keep a can of Can-A-Wipes in your fishing box or car so you can remove that pesky fish smell from fingers, lures and clothes. The practical 120 pack (or tub as we call it) is great to keep in your boat or next to your fishing box. It offers you easy access to your cleaning wipes and requires no additional liquid or napkin. Just wipe and go! We know… those oily hands and dark stains on your clothes look cool while you’re in the garage. But there comes a time in which you need to clean off the tar and get back to society. A large tub of 120 Can-A-Wipes is the perfect choice for cleaning chains, gas tank, seat, pedals, lights, handles and everything else. Can-A-Wipes are free from aggressive chemicals and are soft on vinyl and leather so you won’t hurt your bike. What else can Can-A-Wipes clean? Cars – remove tree pitch and road tar. Also can remove many stains from leather car seats. Can-A-Wipes is a ready-to-use cleaning wipe, no water, chemicals, or drying needed—just wipe and go. Unlike other wipes, Can-A-Wipes does not dry out or crack your skin. Each wipe contains 4 different skin conditioners, including glycerin, lanolin, aloe, and vitamin E. These wipes are TOUGH – NOT ROUGH!